We are open 24 hours a day all year round: no curfew, no lockout! We have free WLAN, free bed linen and free luggage room for our guests' use. 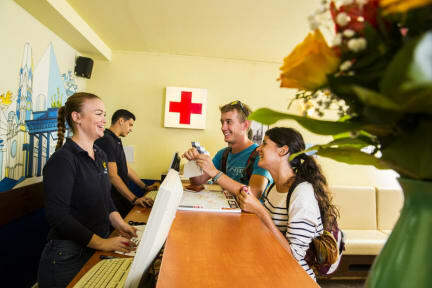 Pegasus Hostel Berlin is visited by lone travellers, small groups and families. We receive an international mix of guests and the average age of our guests is in the mid twenties. Very big and very clean hostel. Lots of services abailable, and the staff were really helpful! About 10 min walk to Ostbahnhof. Good place, good location. Easy and comfortable all around. Overall had a great stay at Pegasus-super friendly staff, great location. Beware though, I think there were bed bugs in my mattress- though my friend didn’t experience anything I woke up with bites everywhere. Also, in the dorms the bathrooms don’t have good ventilation, something to think about! But despite that I would probably stay again as otherwise it has many positives and in summer would be awesome as there is a massive courtyard to drink beers in! We had a problem on our first night but the staff were incredible helpful and did everything they could to make sure we were okay. The night staff as well as the manager. Thank you very much 😁 Fair walk into the main city but was still near food etc. Table and chairs in the room meant it was sociable. There was a nice outdoor courtyard (but was a bit cold this time of year for me) . 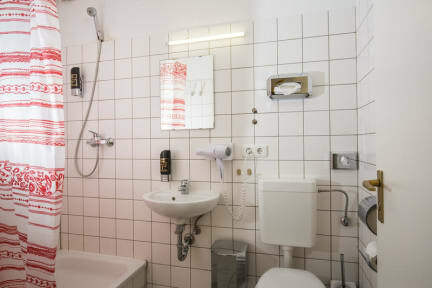 Well located, friendly staff, pleasant courtyard - an excellent base for a Berlin visit. The room we had was sparse and badly ventilated, but clean and safe. The breakfast is a bit grim, and you'd be better off spending your €7 in the supermarket over the road (which is a great plus for any budget traveller). We stayed in this hostel 12 years ago and enjoyed it so much we recommended it over and over. The hostel though hasn't changed much since then. It looks tired and could really use a coat of paint. There was graffiti on the beds and pieces missing from the floor. It was clean enough just looked really used. The staff though are fantastic and were kind enough to move us when our chain smoking neighbours made our room too stinky. The location is still super! As a hostel it works fine.